I am going to tell you why you should buy a Suzuki Wagon R.
I got mine through accident really. I saw a Saxo advertised at a local Garage and I had just enough cash saved up to buy it. I managed to get my old Fiat Cinquecento down there and was quite honest in my appraisal to the very nice Car Salesman, “It’s c__p” I told him and after a fairly detailed inspection, he agreed. I told him the car I was interested in and we began to filter through the plethora of cars about 10 years old, which if they sold one they’s spend the rest of the afternoon getting it out. 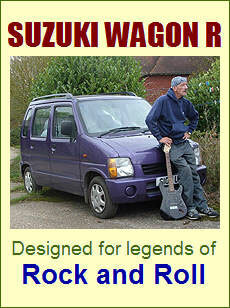 But on my way over I was, bit like the road to Damascus, blinded by this rather attractive purple Suzuki Wagon R.
It was about £400 above the money I had, but I asked about it. I guess he knew I was an old git because he showed the cunning front passenger seat which rises up and uncovers a detachable Shopping Basket, the drawer under the drivers seat and suitability the Boot had for a wheelchair. I was most impressed, the mileage was good, power steering, air bags, five doors, loads of head room, central locking (haven’t had that before) and a Radio that worked! I asked him what he would allow for my old car and I was amazed that it worked out I’d only need another £100 to buy it. After the old “Well, I’ve got lot’s to pay for at the moment, the cat’s got to go to the Vet, the Chicken Food’s nearly run out”, I offered him one hundred less – and he took it ! Off I trotted to the Bank and got the cash out straight away, no Credit Crunch with me, just the blue one’s Mate ! Needless to say I got the full going over at Work and from the neighbours, “Blimey, with those seats down, you could live in it Dicky”. Well, you never know! Within a couple of days, I was transporting Chickens, moving an old Fridge down to the Tip, the things I could do with it were incredible. I knew it was a pretty hot car as soon as I brought it. It was indeed, the Radiator blew after four weeks, but a kind colleague at work fixed that in a flash. Since then, all’s well. The Grandchildren love it. The bottoms of the windows are quite high, so this enables them to slide down in their seat and hide whenever they spot a friend approaching. Leo likes it too and looks good wearing his wig, false moustache and a wooly hat. He prepares for every journey, ensuring he doesn’t shave for a week before hand. But, I like my Wagon R. Fair enough, the colour is a bit ‘identifiable’, but at least it shouldn’t get nicked and it goes with my mood. We’ve been to Belgium and France in it (not necessarily in that order) and eyes have turned I tell you, although that could be because I didn’t shut the boot right and the sleeping bag dragged along the road between Ypres and Calais. On a serious note, they’re easy to drive, easy to steer, very good on Fuel and you actually feel it’s about four times the size it is. I’m sorely tempted to buy another one when this runs out.